Synopsis: Nancy is surfing on a secluded beach when she finds herself on the feeding ground of a great white shark. Though she is stranded only 200 yards from shore, survival proves to be the ultimate test of wills, requiring all of Nancy’s ingenuity, resourcefulness, and fortitude. Director Jaume Collet-Serra (Non-Stop, 2014; Unknown, 2011; Orphan, 2009) brings us this taut well-crafted thriller with a top notch performance from Blake Lively (Café Society, 2016; The Age of Adaline, 2015; Green Lantern, 2011) as Nancy who has planned a perfect surfing getaway trip to a secluded Mexican beach when disaster strikes. Although only 200 yards from shore, as she tries to catch her last wave, she finds herself trapped and fighting to survive attack from a hungry, great white shark. Scriptwriter Anthony Jaswinski gives us a tense ninety minutes in a straightforward narrative about a woman against nature. Blake Lively does a great job of holding our attention as he demonstrates Nancy’s ingenuity in her battle to survive. The film is well served by stunning cinematography from Flavio Martines Labiano – particularly breath-taking in the surfing and underwater scenes – and by convincing CGI shark special effects. 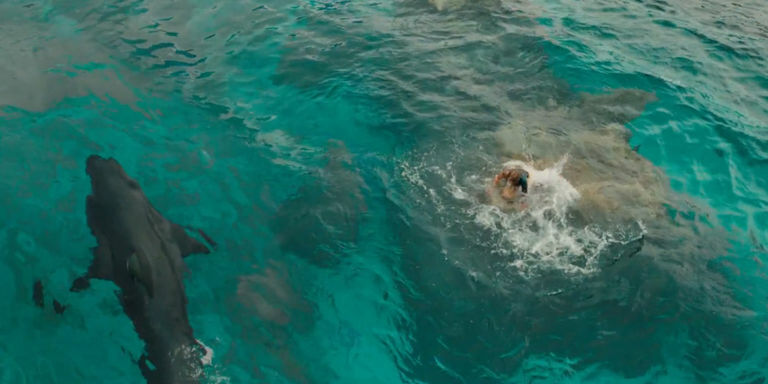 It is probably unfair to reference Jaws or other shark or endurance films, since The Shallows has enough originality, beauty and terror to keep viewers entertained.